Goldendale Observatory State Park is an educational facility on the northern side of Goldendale, Washington, notable for its unusually large public telescope. The state park occupies five acres (2.0 ha) atop a 2,100-foot (640 m) hill. Access is via a winding paved road through an oak forest. The site includes a small picnic area, interpretive center, amphitheater, and the observatory. There are several telescopes on-site, including portable Dobsonians, a permanently mounted Hydrogen-Alpha solar telescope, and the primary instrument; a 24.5-inch reflector which is housed in the South Dome. The facility receives 30-40,000 visitors annually. The 24.5 Inch Classical Cassegrain Telescope as it appeared in 2014. The main telescope is the reason for the existence of Goldendale Observatory and was the work of four amateur astronomers — M.W. McConnell, John Marshall, Don Conner and O.W. VanderVelden — who built a 24.5-inch (620 mm) Cassegrain reflecting telescope. At the time, this instrument was one of the largest amateur-built telescopes in the world and was originally intended for Clark College in Vancouver, Washington. However, due to the typically wet and cloudy weather on the windward side of the Cascade Mountain Range, the four gentlemen sought a clearer, darker area to install the telescope. While getting food and gas in Goldendale, Washington, the builders met a local diner owner and city council member who suggested they donate their telescope to the town. After some reluctance, an agreement was made and the telescope was donated to Goldendale on the condition that the community build an observatory to house the telescope. A local, non-profit organization was created to plan and support the observatory which was ultimately constructed to the north of town using donated, loaned, and federally granted funds. The intent of the founders and community was for the facility to serve primarily as a center of public science education and not scientific research. The south observatory dome has a diameter of 20 feet (6.1 m), and north dome a diameter of 10 feet (3 m). The observatory served as the National Astronomical League's official headquarters during a solar eclipse which occurred on February 26, 1979, six years after the observatory opened. Approximately 15,000 people came to the town of Goldendale on that date to observe the eclipse. The Observatory and its lands were acquired by the state of Washington in 1980, after being operated by the Goldendale Observatory Corporation since its dedication on October 13, 1973. The park received its new designation as a "state park heritage site" in 2014. In July 2017, all structures but the south dome were scheduled for demolition to make way for a new, larger facility. With funding secured, the renovation project began in early 2018, with completion expected by mid 2019. ^ a b "Goldendale Astronomical Observatory". Geographic Names Information System. United States Geological Survey. 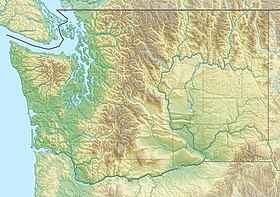 ^ a b "Goldendale Observatory State Park". Washington State Parks and Recreation Commission. Retrieved February 18, 2016. ^ "Commission Policy 72-14-1 Naming of Parks..." Washington State Parks and Recreation Commission. March 27, 2014. Retrieved August 6, 2018. ^ "Observatory Upgrade". Goldendale Observatory. Retrieved August 6, 2018. This page was last edited on 12 November 2018, at 02:22 (UTC).